Ryan Zinke’s 2018 has been Not Great so far. The Secretary of the Interior announced a widely opposed plan to drill everywhere then carved out an (in all likelihood illegal) exemption for Florida that got him dragged by politicians on the left and right. 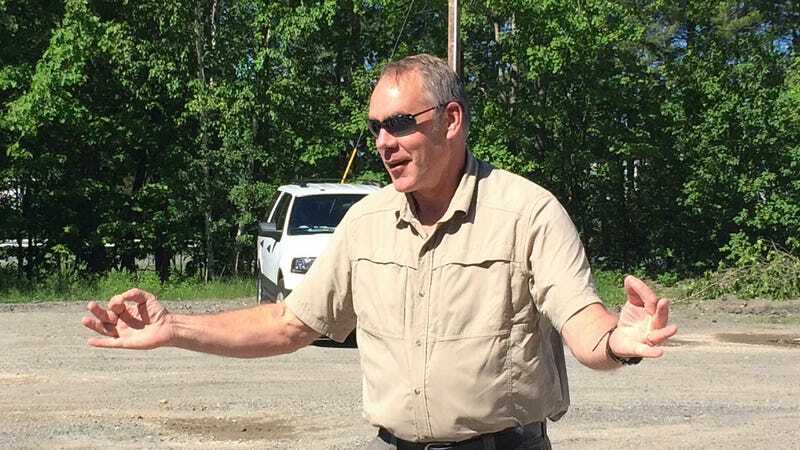 Perhaps in an effort to turn the page, the known jet setter and oil advocate has started discussing his next big move: the largest reorganization of the Department of the Interior in history. Details of the long-rumored proposal trickled out on Wednesday. Maps obtained by E&E News show that the boundaries of the currently regional offices that follow states will be tossed out. In their place, Zinke is proposing 13 new regions that align more with watersheds and mountains. According to the Washington Post, the plan would vest those regions with more authority and also result in new headquarters offices for various agencies under the department like the Bureau of Land Management, the Fish and Wildlife Service, and the Bureau of Reclamation. That also means upending the lives of hundreds and possibly thousands of employees working in the current regional offices as well as Washington, D.C. The watershed-level approach does appear to be a common sense idea. Most state boundaries—particularly those box-shaped ones in the West—are fairly arbitrary. By following watersheds, the department could in theory manage land more effectively. “USGS put together some good maps for him, and honestly it would be great if we could manage federal lands by watershed boundaries, but the states will never let it happen,” Joel Clement, a former Interior manager and researcher at the Stockholm Environmental Institute, told Earther. But it’s hard to take Zinke’s proposal entirely in good faith. He just killed climate adaptation and environmental remediation guidance that was based on the exact kind of landscape-scale management principles he’s advocating for with the reorganization. And he certainly seems more interested in mining and drilling as much federal land as possible rather than conserving it, leaving it an open question whether management priorities will shift and who will benefit from the reorganization. He also supports slashing the department’s budget by $1.6 billion and firing 4,000 members of its workforce. The latter would conveniently become easier if the reorganization goes through, or at least convince some employees to quit or retire rather than uproot their lives. In an interview with the Washington Post, Zinke said as much, noting that 40 percent of the agency will be up for retirement in the next five years. “Any plans to reorganize need to be seen in the wider context of Zinke’s crusade to downsize and change Interior’s mission by handing over our public lands and waters to oil companies and other special interests,” Alex Taurel, deputy legislative director of the League of Conservation Voters, told Earther in a statement. While some Republicans in Congress like the Utah delegation might like that, it’s hard to see that going over well with Republican in other states where Interior is a large employer (though at least a handful do support moving workers from Washington to the West where most federal land is). This is to say nothing of the reality that it’s also a bad idea to reduce oversight and management of the millions of acres the federal government controls. “I will say most people view this not as an attempt to streamline but an attempt to downsize” Interior’s workforce, Sally Jewell, Obama’s Secretary of the Interior, told the Washington Post. There’s also not a lot of history to point to that shows Zinke would be successful. The move would have to be approved by Congress where other grandiose attempts to reorganize departments have frequently curled up and died. “This rabbit hole should keep the Zinke team out of trouble for awhile, but the failed effort will cost taxpayers a lot of money,” Clement said. President Obama wanted to move the National Oceanic and Atmospheric Administration from the Department of Commerce to Interior. It did not go over well and faded away into the ether. More recently, a 2015 proposal to merge the Bureau of Land Management offices for New Mexico and Arizona flamed out after Republican and Democratic representatives pushed back against it. But we live in weird times. This plan could very well develop and go through, leaving the Department of Interior in very different shape than it was when Zinke took it over. This post has been updated with comments from Joel Clement.